In half a gale from the west Folkestone′s new Lifeboat, “Leslie” was launched on Monday morning. At about 11 o′clock the loud report of a canon startled a large number of townspeople and visitors, who hurriedly wended their way to Dover Road in full anticipation of the Fire Brigade turning out to the scene of some conflagration. This, however, proved not to be the cause of the report, and the rush of fishermen towards the Lifeboat house soon explained that the new lifeboat was to be launched. With great promptitude the crew of the lifeboat had gathered and were eagerly engaged in the work of arranging gear etc. All preliminaries having been settled for the launching, the crew donned their lifebelts and sou′westers, the ropes were affixed to the Victoria pier, and the boat, amid a round of cheering, was sent down the wooden blocks into the rolling surf. There was sufficient sea on at the time to remind one of the tempestuous weather when calls of help from distressed vessels are most frequent. 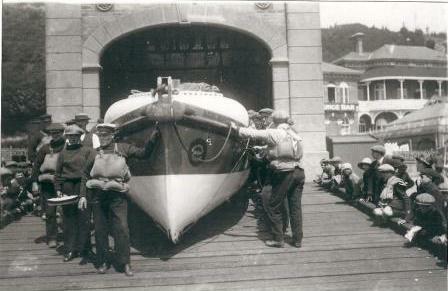 The launch was the quarterly one held under the auspices of the Royal National Lifeboat Institution and the fact that the craft was to receive its first dip in the hands of Folkestone lifeboatmen aroused much interest among the nautical section of the community. 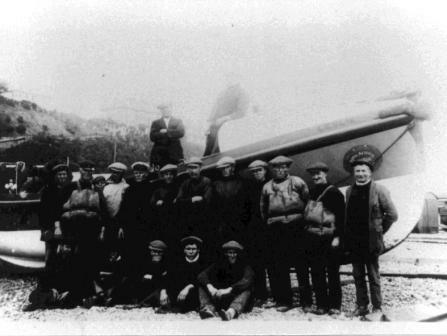 As the vessel struck the water heavy breakers were encountered, and the ropes attached to the pier not proving of much service the crew had to push themselves from the beach by means of their oars. Once out of her depth the “Leslie” made a grand start, and the jibs being hoisted. A splendid run to south east was accomplished. It was the opinion of the whole crew that the vessel behaved splendidly. In Weight it is a ton lighter than the old boat and possesses a centre keel. In length the craft is three feet shorter than the “John McConnel Hussey” (which has been removed from the port) and has 6 inches more beam. A marvellous escape from serious injury was witnessed immediately after the launching of the boat. As a shower of rain came on the crowd made their way to the lifeboat house for shelter. Here it is that the rocket as signal to the ship in distress is fired directly the boat is launched and, in accordance with the usual custom at practices the rocket was fired. A young fisherlad, running up the slipway, narrowly escaped the full discharge from the rocket falling on his knees in response to a call of the officials within a few feet of the apparatus. As it was no harm was done. Among those of the committee who witnessed the launch were Councillor G. PEDEN, the Rev. J. LAWRENCE, Commander PREDDY, Messrs WALKER, W. FOWLE, P DAWSON and W. D. FAGG. 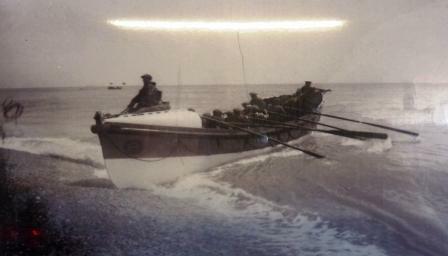 cwts, 2 WB tanks, No.1 rig and 10 round oars. £787.12.2d provided from a legacy by Miss Skynner of Brighton. 1903: repairs to planking & leaks stopped in WB tanks. to gunwale to take cable shaft. bow and bow pudding – repairs carried out. 1928: Partial overhaul, all in good order. COMMENTS : Minute 15/1/31 and withdrawn from Folkstone. Later sale list December 1935.
saved 16 lives at Folkstone.